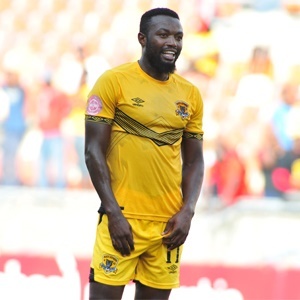 Cape Town - Black Leopards spokesperson Berry Ramunenyiwa says the club won't comment on Mwape Musonda being linked to the big three because the focus remains on finishing the season well. Musonda's 13 goals have made him hot property in the Premiership in 2018/19 and subsequently the likes of Kaizer Chiefs, Mamelodi Sundowns and Orlando Pirates have been linked with his services. Nonetheless, Ramunenyiwa insists the side are focusing on getting into the top eight in the current campaign and the forward can play a major role in making that happen. He told Soccer Laduma: "At the moment, we are only focusing on playing our remaining games of the season. We do not want to be engaging in issues relating to players. "Most of the time when we get to this stage of the season, we get distracted by all sorts of rumours doing the rounds. Our focus as the team is to win the remaining games of the season and to put ourselves in good position on the log... like in the top eight. "The rest about any other issues, whether players coming or going, we will deal with that at the end of the season." Musonda is said to have two years remaining on his current deal and it remains unclear if he will be available for sale ahead of 2019/20. The striker has a chance to increase his goal total in the Absa Premership when Lidoda Duvha take on Kaizer Chiefs this Saturday at Thohoyandou Stadium.